I have a list in my head that is about as long as my arm for all the things we need to get done in this old cottage of ours. Sometimes I walk around just overwhelmed by the amount of work (and money) that it will take to get things the way I want them. Sometimes Pinterest doesn't help at all, it just makes me frustrated and jealous of these amazing places with perfect styling and makes me worry that I will never get this place to a place that I am happy with. Over four years ago we bought a fixer-upper. As first home owners we had dreams of renovating our new home with vision of what we wanted, we were so excited. Reality set in pretty much after painting the entire house. Four years later there is still soooo much to do (the kitchen still isn't finished) and there's not enough time in the week to do it, and not enough money in the bank to complete it all anyway. 1. Focus on one thing at a time: Looking at everything can be overwhelming so just bite off a small achievable chunk to complete. Even accomplishing one small thing (ie. this weekend I reorganized our hall closet) will make me feel like I am achieving something and moving forward. So picking one project or one room and focus on that until it is finished, is good thing to do. 2. Life isn't about having everything perfect, our house looks Lived in, I mean really lived in. And that's ok with me most of the time, because it means we have more time to enjoy each other and time to play with our amazing little boy. We could spend every day cleaning, gardening, reorganizing and renovating but we would miss some really amazing family moments. I know what I want my priority to be, that means some things don't get done, and I can live with that. 3. I can't have everything I want, but that is not going to hinder my happiness. 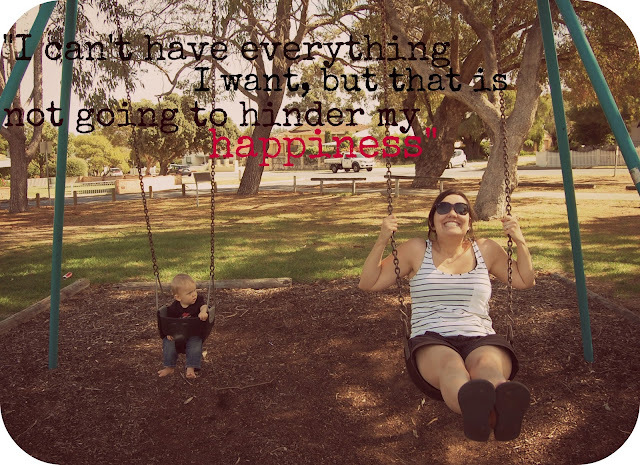 Being content with what I have, and enjoying where we are at is important to me. We may not have the most amazing house with all the luxuries, but we are very lucky with what we do have. I am so grateful that I can be a stay at home Mum, but with that decision we need to make sacrifices, I need to remember that it is worth it. We are so blessed with what we have, and so much better off than so many who don't even have enough food to eat on a daily basis. So instead of focusing on what we want, sometimes I know it is important for me to take time and be grateful for what we have. Anyone else have some great tips on what works for you. 1 comment on "One thing at a time"
Dear karen, I totally agree with you. Being a stay at home mum my family too is making sacrifices. But none of those is as important as me spending every moment with my little man! We too have bought a fixer upper and are renovating. Our bathroom will be gross for years! But we have done heaps to make our house clean and better than when we bought it. It's actually being painted this week and now I'm scared it's going to get dirty, something I didn't care about before!